Dozier Gives Best Mother’s Day Present Ever: Inducted Into TTBB’s Scorpion Jacket Hall of Excellence | That's Twins Baseball. A Minnesota Twins Blog. SOMEWHERE AWESOME — The Twins have been looking for competent shortstop ever since they traded away J.J. Hardy. While Jamey Carroll has played competent shortstop, the Twins made the descion that shortstop was no country for old men. Since Dozier has been inserted into the lineup, he has showed great range and hands at shortstop while coming up with a few big hits. His biggest hit came today today when he hit his first major league home run (which also tied him with Albert Pujols for home runs on the season). Even more impressive was that he hit the ball in the second deck in left field. That’s not something Twins fans are used to seeing….unless it’s a Blue Jays hitter. After that impressive shot off a Twins bat, he was probably told to pee in a cup after the game. Dozier also turned a nice double play when he jumped and caught a line drive and then doubled off the runner at second base. That defensive gem, along with his herculean shot to the second deck, made the committee’s choice an easy one. 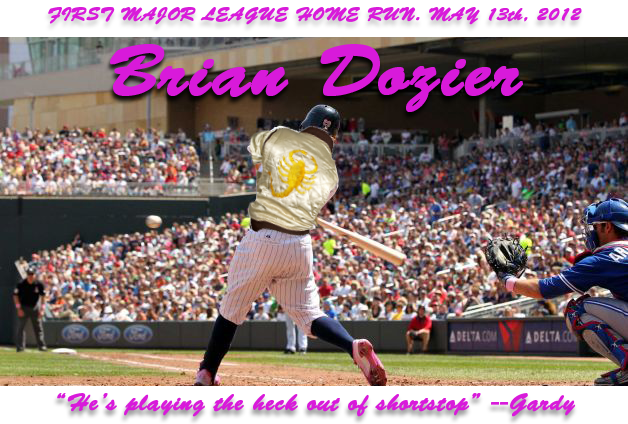 Welcome Brian Dozier to TTBB’s Scorpion Jacket Hall of Excellence. You can see the rest of the TTBB SCJHOE here. A very prestigious and honorable group. The Gardy quote in the picture was lifted in a story from Tyler Mason over at FSN. He’s got a great article about Dozier and Mother’s Day that I recommend reading.